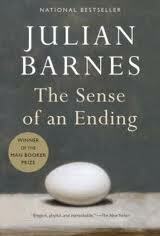 At first bookstore-shelf gaze, The Sense of an Ending by Julian Barnes is deceptively slim. In fact, due to its thicker stock, historied pages, it almost seems padded a bit. But as with most things in life, it's not the quantity, but the quality of a thing that sets it apart, and this book is no exception to that rule. Clocking in at 163 pages, this would seem an easy read, but you would be deceived to judge this book on its final page count. What is woven within those pages is a story contemplating the nature of relationships, of time, occasionally even of life itself. Tony Webster is, by all acknowledgement, including, perhaps especially, his own, a very average man. He's led an average life, gone to school, graduated from university, married, divorced, fathered a child and settled into an entirely average retirement phase. He doesn't do much, really, he's never done much, on first consideration, until an unexpected notice forces him to delve into his past. Tony's memory lane is bumpy at best, with tangents of forgotten or perhaps even re-edited memories, that lead to an incomplete picture painted by a completely unreliable narrator. It's odd, for a book in which little is revealed and nothing is seemingly changed, it's filled with beautiful prose that highlights the question of memory versus imagination and the accounts of ourselves that make our lives the easiest to live. Split into two parts, Young Tony and Old Tony, it's impossible to get a complete picture of Tony at all, mostly because, as in real life, we are never capable of seeing the entirety of ourselves. Our own assumptions of ourselves and our lives are a combination of feedback from the people we surround ourselves with and our own opinions of those people and those situations. Who we trust, who we love, who we discard, the opinions we choose to overlook, the criticisms we choose to take to heart, all of those things contribute to a life that, when looked back on, is never entirely factual, and is full of hazy opinions at best. We're never living an entirely black and white experience and it's that journey in the grey that is documented so well, but so frustratingly, in this novel. The story itself is meandering, like most of our memories tend to be. Written entirely from Tony's inner monologue, the reader is only meant to understand others and understand Tony from his own flawed re-telling of an already cloudy situation. All we get are blips on the radar, moments in time that surely have effected Tony's life, but the important moments, or what outsiders might consider important moments, are left out. The result being that the reader is often forced to attempt to connect the dots, or guess at where the dots should be, in order to make any sort of sensible shape. It's not easy and if you're unwilling to go along with the philosophical nature of the novel as told to you by a guy who couldn't seem to care less about the world, then it's going to be a read where at the end you just simply say to yourself "WHAT was that?!" It's one of those novels where there is no clear cut beginning and no clear cut end and the journey is only interesting because of the discussion that it will produce. Everyone will have an opinion on this book, and pretty much every opinion will be different, but perhaps, if you talk to enough people about it, the puzzle will begin to coalesce. I recognize that it's not necessary to have characters to like and that the drama of a story usually comes from the conflict, but here, I just couldn't find anything about Tony to latch on to, and later, couldn't find very much redemptive about him either. He's a man who is so willing to shirk responsibility, and who is so unwilling to face any truth or ugliness about himself that it's difficult not to want to mentally slap him. He's just so nonchalant about it all, and the lack of passion was something I personally had a difficult time wading through. The ambiguous ending (ambiguous is a kind word here), is one of those that will be looked back on with a mixture of brilliance and frustration weeks after finishing, like that last moment of The Sopranos if you're looking for a pop-culture equivalent, but in a more immediate sense I have to believe that frustration is the only emotional ingredient as your brain stews. It's impossible to really know what happens, because we never really know Tony. Still the writing itself and many of the ideas are wonderful and intriguing; they work on such a philosophical level that it definitely feels longer, and more substantial than it's 163 pages. It's a satisfying read as long as you go in ready to think, but in terms of sheer entertainment (which again, I realize not every novel need be) it's certainly not an escape. It's a novel that's so full of thoughts on how we live our lives, how we see ourselves and the choices we choose to remember that it almost makes it a respite to go back to only having to consider our own thoughts once we put the book down. It's one of those books that feels like a triumph to finish even if you can only attempt to understand it.